It is very important that all events are added to the calendar (even if the event occurs off campus) to avoid conflicts and to keep faculty, staff, and students aware as events are planned and executed. Please add your events as early as possible to allow time for approval. 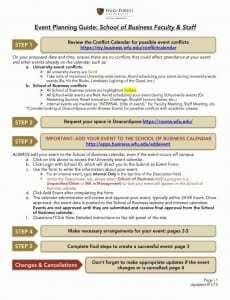 Note: By selecting “School of Business” and a program under the department tab, your event will automatically be added to both the School of Business and University calendars. The exception is internal events, which will only show on the internal School of Business calendar on the Intranet. Questions about the calendar? Contact Sydnee Alms in Marketing & Communications at 336-758-2446 or almssl@wfu.edu. Departments and organizations are already lining up events for the fall and spring semesters. Here are smart reasons to make sure your event is on the University Calendar. The calendar is mobile: With the new WFU Events App, available through iTunes, users can search, sort and filter events by date, audience or event type and add events to their calendars. Social sharing: The calendar has social media features. Make a Facebook events page and link it to your calendar listing. Less confusion: Has the time or location changed for your event or has it been cancelled due to weather? When you submit an event, you can make changes as needed. Those who “Add an event” to their personal calendar will automatically receive notification when details change. The Wow! factor: Add a movie trailer, video, photo or PDF to your calendar listing to preview the event and improve turnout. Here’s an event listing that takes advantage of this feature. If it’s open to the public, the public is notified: If your event is on the University Calendar before the 15th of the month and it is listed as “open to the public,” it will be automatically shared with local news media and submitted to Piedmont Triad event calendars. Reminders for faculty and staff: Each Friday an automated email announcing upcoming events called “Next Week at Wake” is sent to faculty and staff. Events must be on the University Calendar to be included. You can submit an event on the University Calendar page by clicking the “Submit an Event” bar above the calendar on the right-hand side of the page. Here is a link to some basic instructions for submitting your event should you need help. 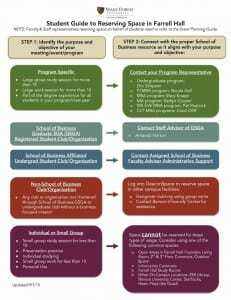 Questions about the MRE Center of Excellence Request Form? Contact Meko Lawson, Market Readiness and Employment Coordinator, at 336-758-4119 or lawsonml@wfu.edu.